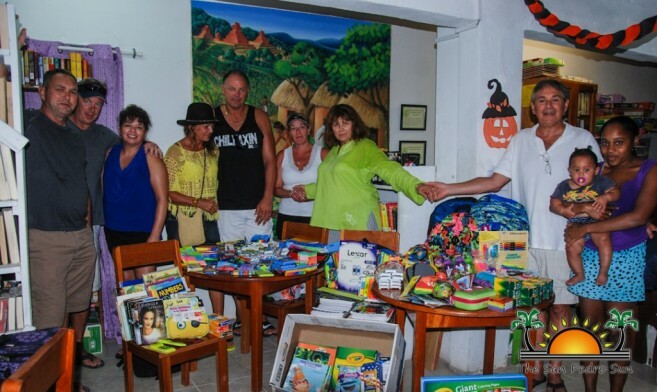 The San Pedro Town Public Library received a generous donation of much-needed school supplies and swim toys on Tuesday, October 25th. 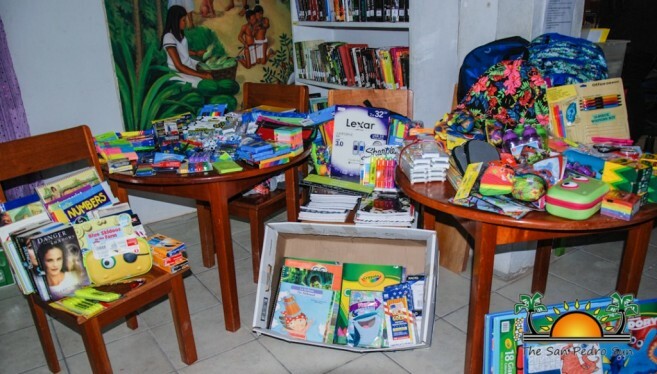 From crayons to paint, markers, pencils, highlighters, books, and even backpacks, the library welcomed the donations from Rick and Leahann Bernstein. According to Library Assistant Marlene Coral, the Bernsteins visited her previously, and asked her to write a list of school supplies that the library needed. The couple recently tied the knot on Sunday, October 23rd at Caribbean Villas, and they decided to make their wedding a bit more interesting. Instead of asking for wedding gifts, the Bernsteins asked their invited guests to bring school supplies that would be donated to the library instead. With much support from their family and friends, more than two large suitcases were packed with school supplies. For the Bernsteins, the children in San Pedro have a unique charm in them, which they compare to the beauty of the island. “We fell in love with everything about Ambergris Caye, and I love the idea that all of the kids from the different school come to the library. For many of them, the library is the only place they have access to the internet, and we like knowing that this is the place that a little bit goes a long way. We are also very happy to have shared these experiences with our friends who did not know of Belize,” said the Bernsteins. On behalf of the library, Coral thanks the Bernsteins, along with their friends for the donations. “I thank the Bernstein’s and their friends. I feel really blessed to have received these donations because I was just thinking last week about my stock. Normally when we have activities, we have giveaways, so these donations come in handy. Since I was trying to mentally prepare for next year, I also wanted to balance my donations, and what I had was not enough. I am very grateful,” said Coral. The library is hoping to renovate its building by re-painting, and painting each section in the library a different color. As usual, the library is always appreciative of donations. Since a microwave has to be loaned during their movie nights, they currently need their own microwave to make popcorn. Also, the library is still asking for a desktop computer to serve as their circulation desk. If you are interested in making a donation, you may call Coral at 206-2028/631-1818, or you may visit the library at South End Barrier Reef Drive. All children are cordially invited to attend the library’s special Halloween-themed Movie Night on Saturday, October 28th. The event starts at 6:30PM, and a Halloween movie will be voted on. Children are encouraged to wear costumes, and bring along their blankets and pillows. Prizes will be given away to those who win first place in the costume contest. The library will be fundraising, and selling snacks and beverages. If the weather does not permit, movie night will be held inside the library. See you there!